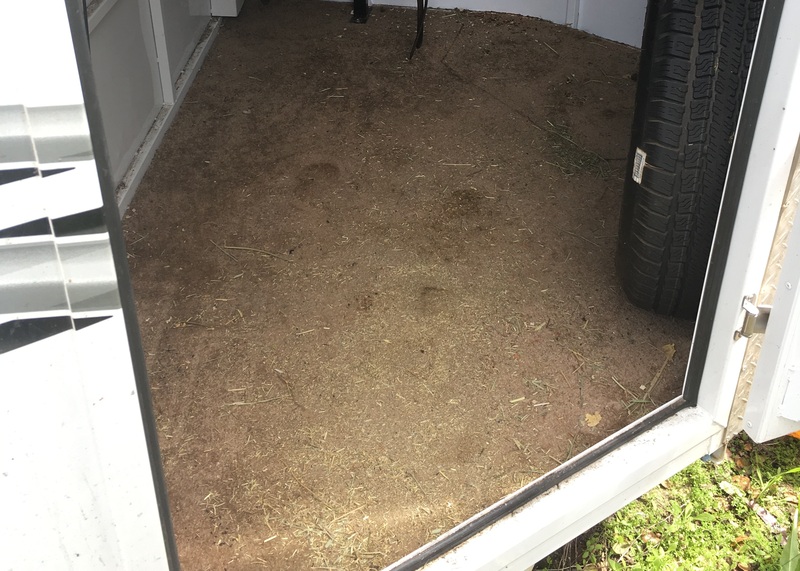 When we bought our new trailer, it came with the worst flooring in the tack room. It was this terrible shag indoor carpeting. 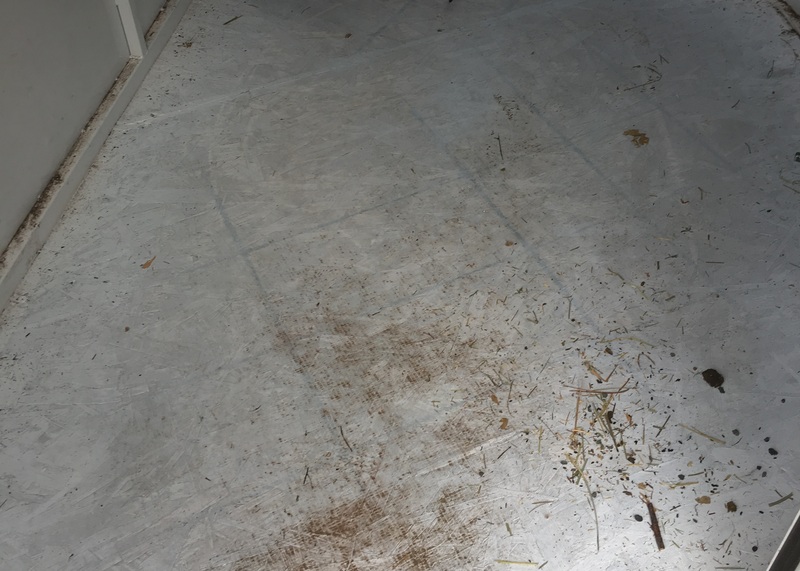 It collected dirt and moisture, was impossible to clean, and made it really inconvenient to use the tack room for changing as you couldn’t really step on the floor without shoes on. I’ve wanted to replace it since the day we bought it, but didn’t get around to it until a few weeks ago. If you’re thinking that modifying your trailer is too difficult to do yourself, trust me, anyone can do this. It’s easier than making horse treats. You don’t need any special tools or any mechanical knowledge. You might need some pliers to help you pull up the carpeting in your tack room, but that’s it. Empty out your tack room so there’s nothing on the floor and then pull out your old carpeting. We had to pull our spare tire out as well, but you may not need to. Our carpeting was just laid down on top of the wood and not glued down or secured in any way. 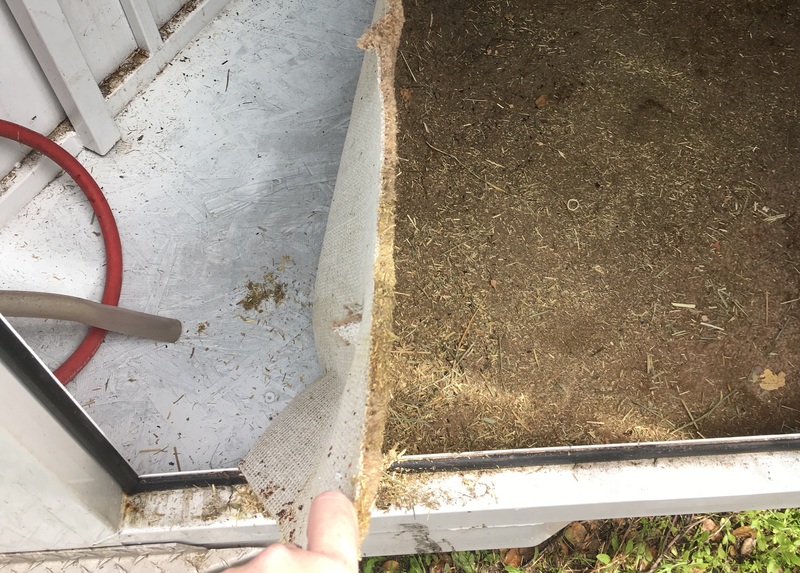 When we bought the trailer, we had the saddle rack moved and it was placed on top of the carpet so we had to cut around that with the scissors and then use pliers to get that bit ripped out. The rest of it just lifted right off. Sweep out all the hay and dirt so it’s clean. 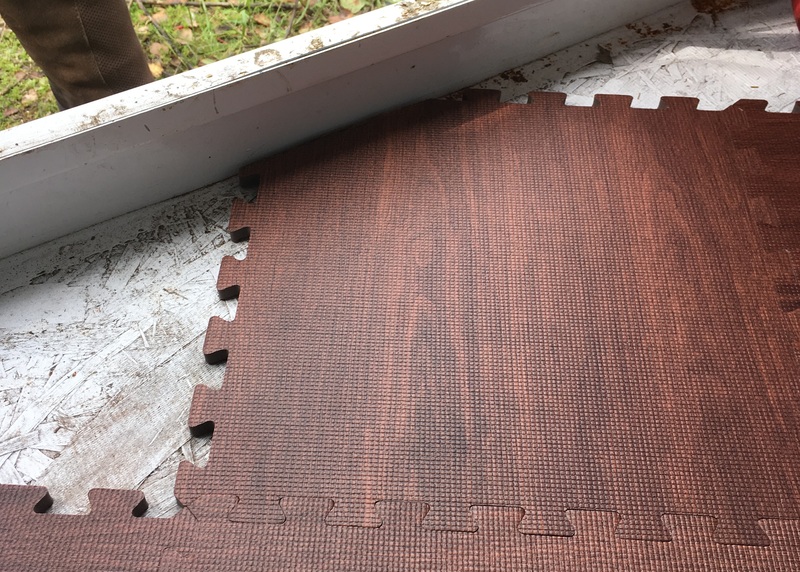 Starting with the longest straight wall in your tack room, lay out the foam tiles and connect them together. We lined up the grain of the wood print to all go the same direction. This is optional and if you bought foam tiles in a different design (like black or multi-colored) not necessary. Add as many full blocks as you can. Get all of these laid out before you start cutting. You’ll need to start cutting pieces. I found it best to connect the pieces into their neighbors and then bend them along the wall, draw a line with the sharpie in the bend and then pull them back out to cut. You may also need to cut little notches in to go around steel bars if your tack room has them. Regular scissors will cut the blocks easily. Once cut, push them back into their spot. Continue around the tack room until the floor is covered. New flooring. This whole project took less than an hour and is a huge improvement. The floor is cushioned, but waterproof and easy to sweep out. We bought a cheap floor mat to wipe feet on and cut down on the dirt in the tack room, but you don’t even need one; it’s just a nice addition. 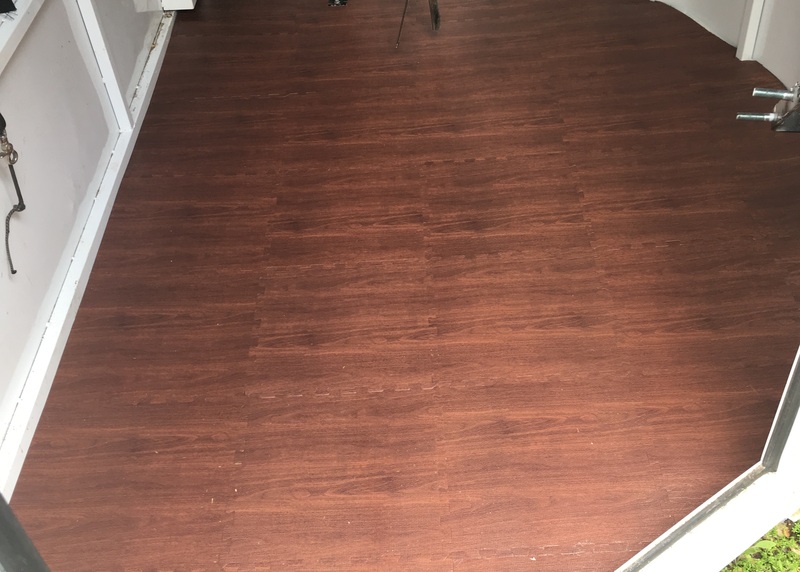 This flooring is really convenient and makes the tack room much easier to use. And it looks really nice. It’s very obviously not real wood, but I like the fake wood grain look. These foam mats come in lots of other colors and options so you can customize your floor. The tiles are also really cheap. Prices fluctuate on Amazon, but we spent less than $50 to buy the 16 tiles and we have a few extra we stored away in case we ever need to replace one.FYI: The mats we bought came with the border pieces. Not all of the mats sold on Amazon do, so make sure you check before you order. Wow, that looks terrific. I love this idea and I am filing it away for later. I also have to say that that carpet is really gross. That carpet…why would anyone think that is a good idea?? The after looks really good. I don’t think they thought it was a good idea so much as it was the cheapest thing they could do and this is the cheapest, junkiest trailer so they picked the cheapest thing they could. Wow I really love the final result! We have that stupid all weather type carpeting they use in boats in our trailer — but it’s a gooseneck​ so it goes up that half wall too :-/ wonder how hard it would be to leave that but replace the floor. I dunno with that sort of setup. Yours might even be glued into the floor if it’s more professionally put together. Definitely check before you ruin anything. Ours was so bad we couldn’t make it worse. As soon as I get mine back, I’m tackling this too. Mine had the high-traffic low pile carpet in it, which was wet from that gravel guard leak, and of course part of the floor had to be replaced so it’s happening one way or another. I’m waffling back and forth between this, or the peel and stick wood look vinyl tile, which I believe is actually cheaper. A lot of people I know use this foam stuff and it looks good! I thought about doing the peel and stick stuff, but I liked the idea of having some cushioning. I think either way you go, you’ll be fine. Wow that looks terrific. Congrats, you are so dang handy! You don’t even need to be handy to do this one. Seriously, you just need scissors. What a great idea. I’ve been thinking of redoing the floor in my tack room and this is way better than any ideas I had come up with. This is a really easy upgrade. Gorgeous! Why anyone puts shag carpet in a tack room is beyond me. We have the industrial carpet it it’s much easier to handle but a smooth floor like yours would be even better. Hmmm…. 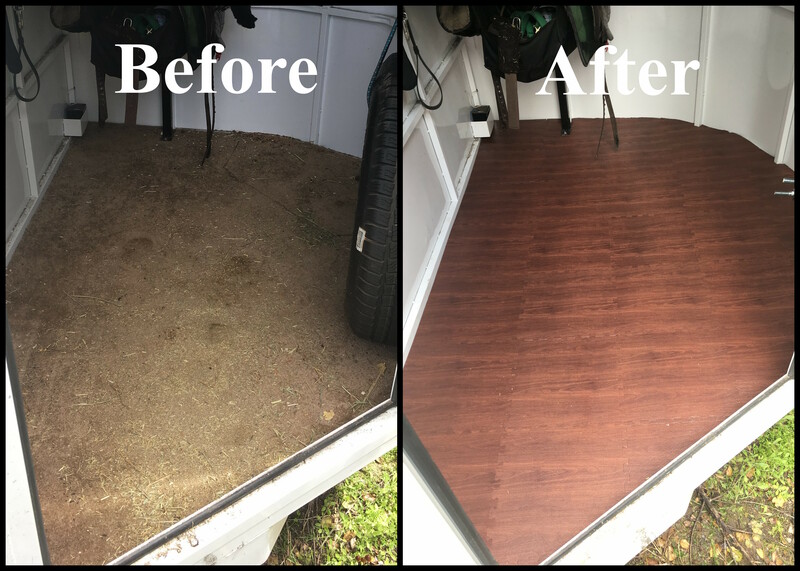 We had the industrial carpeting in our previous trailer tack room and I liked that, but this is actually even easier to keep clean. This looks great! One of the things I love about my trailer is the mat flooring in the tack room. Easier to clean and less disgusting over all. So much better than carpeting. I thought about doing the vinyl, but I liked the idea of having a bit of padding with the foam. That looks amazing and I really need to do that with my trailer too! Looks so much better and more functional! What kind of person puts shag carpet in a horse trailer? Barf! The new floor looks so much better! It was the cheapest trailer ever so the carpeting was to match. Wow!! I love the makeover! Will definitely keep this in mind! It looks absolutely amazing! If you didn’t purchase your tiles on Amazon – where did you buy them? I didn’t see that info anywhere. WOW! I love this. 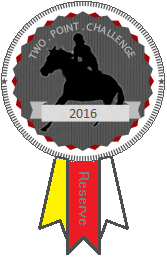 As soon as I get a trailer with a separate tack area, I’m implementing this. Thank you for yet another amazing DIY idea. That carpet is so strange for a trailer! Mine came with carpet, but it’s an indoor/outdoor type carpet, so it doesn’t get moldy if it gets damp, and it vacuums easily. The foam tiles look great in there, that was such a fantastic idea! Sounds pretty easy too. Our previous trailer had the nice indoor/outdoor carpeting too. I actually like the foam even more than that too, but I never would have bothered to change out that flooring.